“What do you recommend for insurance in Mexico” is a question I get asked all the time. The short answer is the CHUBB Platinum coverage from Baja Bound (don’t worry, despite the name, their insurance is valid for all of Mexico, not just Baja). They have great reviews from fellow riders and have always served me well. If that’s all you need to hear, click this link to get an instant quote. 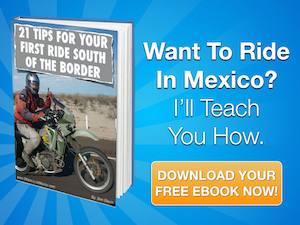 If you’d like to learn more about what is required by law in Mexico and what is recommend, I created this guide to help you feel more knowledgeable and confident about purchasing Mexican motorcycle insurance. Third party liability insurance is required by law in Mexico. Throughout the many roadside checkpoints in Mexico, police may ask to see your proof of insurance. This isn’t as likely to happen as it is in other Latin American countries, nevertheless, it’s not a good idea to be caught without it. Personally, I’ve never been asked to show proof of insurance. Some U.S. insurance companies offer insurance coverage in Mexico. However, the coverage is typically only valid in the free trade zone (~25 miles from the US border). Understand that Mexico authorities do not recognize “foreign” insurance. So even if you’re U.S. carrier says that you’re covered, this will only be for your vehicle. Any damage to other people or their property will likely not be covered. It is important that you purchase insurance from an authorized agency who is incorporated and registered in Mexico before you begin your trip. You can purchase insurance at the border (on either the US or Mexican side). Although most riders choose to order it online before crossing the border (down below, I explain the risks of buying at the border). It’s one less thing to think about on border crossing day, and it takes only a few minutes to fill out a quote request online. You’ll be instantly approved and covered. Print out your papers and be on your way! A few years back, the price for liability only insurance was very reasonable. However, it has gone up recently because the Mexican government significantly increased the liability compensation amounts for fatalities. So in the rare and unfortunate event that another person is killed in an accident, you could be liable for 7x the previous amount. The actual amount varies by state. Therefore, most insurance agencies are suggesting at least a $300,000 USD liability policy with many recommending as much as $500,000 USD liability policy. With CHUBB Platinum it’s possible to get up to $1,000,000 of coverage. For what it’s worth, I go with the $500,000 USD amount since I find the increase in premium cost is reasonable and well worth the peace of mind. The cost of full coverage (comprehensive collision, fire, theft) can be very expensive. But you can get it, and it might make sense if you’re traveling with an expensive BMW GS. Keep in mind that policies for motorcycles will not cover the medical payments for the rider and/or passenger – you’ll need health insurance to cover these costs. If you’re planning a short trip, you can get coverage by the day. Typically for trips longer than 2 weeks, it is more economical to purchase a 6-month policy. If you’re making frequent trips, you’ll find that the annual policy is just a few bucks more than the 6-month policy. What is included in the coverage? Plans vary significantly so read the fine print if you’re shopping around. Civil Liability – Coverage for bodily injury or property damage as a result of your motorcycle. This is the part required by Mexican law. Keep in mind that the rider and passenger are not generally covered under this clause and medical payments are not available for motorcycle policies. Legal Defense – Upon request, the company will appoint the services of professional attorneys and will pay for the procedural expenses incurred for the defense of the rider until the case is finished. Legal assistance is available 24 hours a day. Bail Bond or Guarantee Deposit – The company will post a bond or deposit a guarantee after a lawyer is assigned. Physical Damage and Total Theft – This coverage protects your motorcycle for the lesser of its actual cash value or amount stated on your policy for total theft, collision, over turn, fire, lightning, explosion, and certain natural disasters. Unless a full coverage policy is purchased, it will not cover you if your bike is vandalized or some items are stolen. Towing – CHUBB Platinum allows towing from Mexico to the US with a $1,000 towing limit in case of an accident. This is a huge benefit if your bike is not rideable after an accident! Of course, you also have the option to have it towed to a repair facility within Mexico. In the event of a breakdown, CHUBB will still cover towing up to $1,000. Most other insurers won’t cover towing if related to a mechanical failure (non-accident related). Also, with other insurers, you won’t have the same flexibility for your towing destination nor the amount of expense guarantee. Repair Rates – Unlike many policies sold online or at the border, Baja Bound allows your vehicle to be repaired in the US, Canada or Mexico. In most cases, Baja Bound’s insurers use US labor rates while many other insurers use Mexican labor rates, which are much lower. This can be a big financial difference if you decide to get your bike repaired in the US. Payout Scale for Full Coverage – If your motorcycle is stolen or declared a total loss in an accident, A CHUBB Platinum policy pays out based on the Kelly Blue Book value of the bike. Many other insurers only offer trade-in value which can be significantly less than KBB. Air/Land Ambulance Coverage – CHUBB Platinum beaks from industry standards to offer air/land ambulance service in the event of an accident. This is another reason their policies are so popular with motorcycle riders. Unfortunately, as mentioned above, medical expenses are not available for motorcycle policies. Be sure to read the fine print if another insurer tells you otherwise. Ratings – Why ratings by A.M. Best and Standard and Poors (S&P) matter. The financial ratings listed for CHUBB Seguros’ parent company, CHUBB European Group Limited, is assessed by A.M. Best, a full service credit rating organization dedicated to rating insurance companies. All Baja Bound underwriters are global in nature. These insurers write many different lines of business in many different countries, including the North America and Europe. This is important because global insurers are more stable than local Mexico insurers found online and at the border. Many local Mexican companies have limited lines of business and are unrated. If a global carrier has a tough year it does not tend to affect claims payments, because global insurers have many more lines of business to fall back on to remain profitable. The opposite is true for local companies writing only a few lines of business. CHUBB is the worlds largest property and casualty insurer with over $150 Billion in assets. This increases the groups financial strength ratings to A++ from A.M. Best. I highly recommend you choose CHUBB as your underwriter. What insurance companies do you recommend? Baja Bound – Headquartered in Southern California, Baja Bound always comes highly recommended from riders. Click this link to get a quote. You will find cheaper alternatives online, however Baja Bound goes above and beyond with excellent customer service (which you’ll want if you get in an accident). Also, they use only the most creditable underwriters (of which I recommend CHUBB). Disclosure – I get a small commission if you buy a policy by clicking these links. But there is no obligation, so if you prefer, you can always enter in the website address directly into your browser or seek out other agencies. Thanks and good luck on your adventure! www.MotorcycleMexico.com – Join our community of riders! How To Guide DVDs – Riding in Mexico for the first time? Check out these DVDs and get prepared for your journey!